Hello everyone, today I’m going to be taking a look at some of the best Tritium watches currently available from various popular brands. I’ll be featuring 10 very popular watches that feature the tritium luminous gas tubes below. But first I better explain what Tritium watches actually are. So what are Tritium watches? Tritium watches feature GTLS technology, GTLS stands for Gaseous Tritium Light Source. This is a self-powered illumination system that uses tiny micro gas light sources to provide incredible reliable illumination for up to 25 years. Watches that use super luminova or phosphorous paints for illumination will require charging by light and even though they may initially appear brighter and larger than GTLS they will often fade to nothing between 1 and 4 hours. Green GTLS are the brightest, Blue GTLS is 60% as bright with orange GTLS being 40% as bright as green. If a GTLS breaks if will stop glowing, it can often be replaced though. 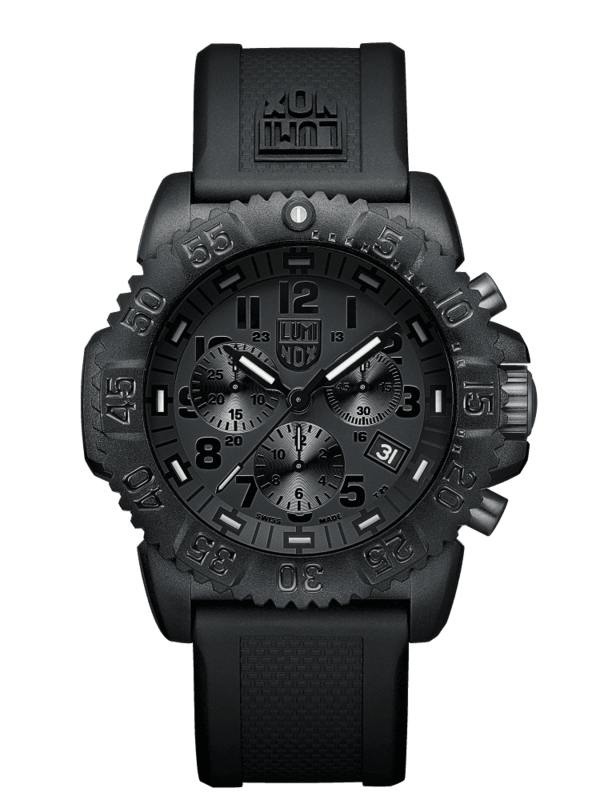 My favourite brand for GTLS watches has to be Luminox. I’ve featured them many times on the site and think they offer some great value for money. 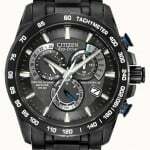 I recently showcased the 10 best Luminox watches for men which I enjoyed putting together. 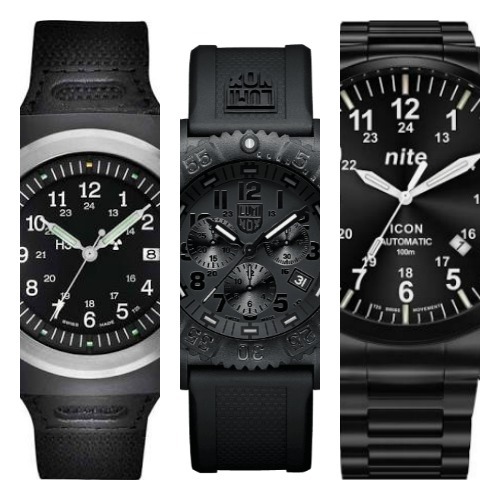 With Nite watches, a British brand coming in a close second. If you have any questions about any of the GTLS watches featured in today’s list just comment below and I’ll try and get back to you as soon as possible. For now, enjoy today’s list. First up on our list of the best Tritium watches for men is this popular black out Luminox. 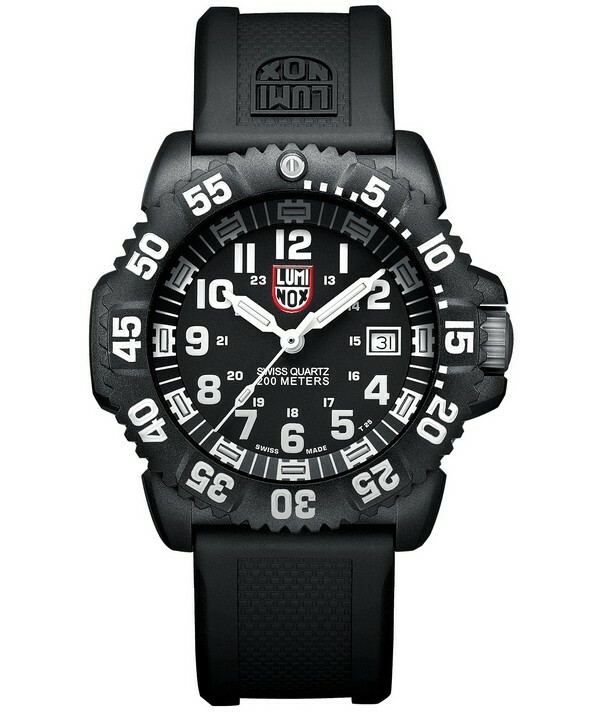 This impressive Luminox watch is built with a large 44mm ultra-light carbon compound case that has a thickness of 15mm. It features a double-gasket security crown for better watch protection too. This has been paired up with a black PU rubber strap and fastens with a buckle style clasp. 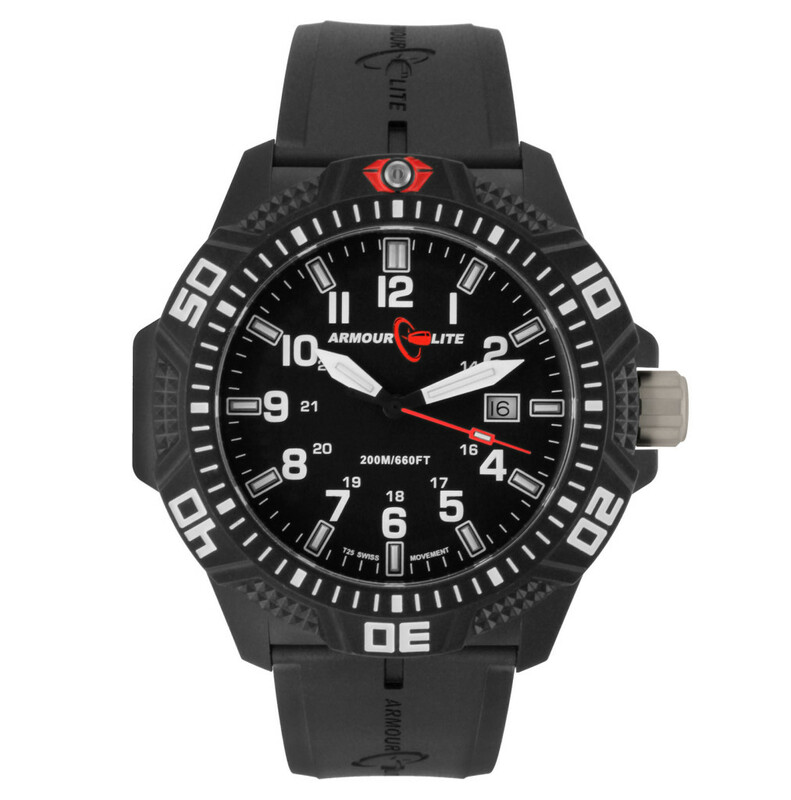 The dial of this Black Out Luminox watch features tritium Luminox light technology -often referred to as Llt. These tiny tritium gas lights are found on the hands, hour markers, and bezel. They provide constant night visibility for up to 25 years without pushing a button or charging, which is why Tritium watches are so popular. There are 3 chronograph sub dials found on the dial as well as a small date display at the 4 o’clock position. They’ve used numeral style hour markers and have contrasting light up hands for easier reading. This men’s Tritium watch is powered by a Swiss made quartz movement for excellent timekeeping and reliability. A tempered mineral crystal glass protects the front of the watch from scratches and knocks. It also has a 200m water resistance rating which is brilliant to see. You can read my full XS.3081.BO.1 Luminox Tritium watch review here soon. Up next in our list of the most popular Tritium watches is the Traser H3. This is a well loved timepiece that’s built with a 38mm resin casing that has a thickness of 10. The strap is made of a comfortable nylon and fastens with a buckle style clasp. On the dial we have a simple easy to read display with numeral style hour markers. The hands and hour markers feature Tritium watch light sources that don’t need an external source of energy to stay running. They’re maintenance free and have a lifespan of at least 10 years. Powering this GTLS watch is a Swiss made Rona movement giving you a great level of accuracy and reliability. The glass protecting the front of the watch is made of a hardened mineral crystal which is often found on watches in this price range. It also has a basic water resistance rating of 30m. You can read my full Traser Tritium watches review here soon. 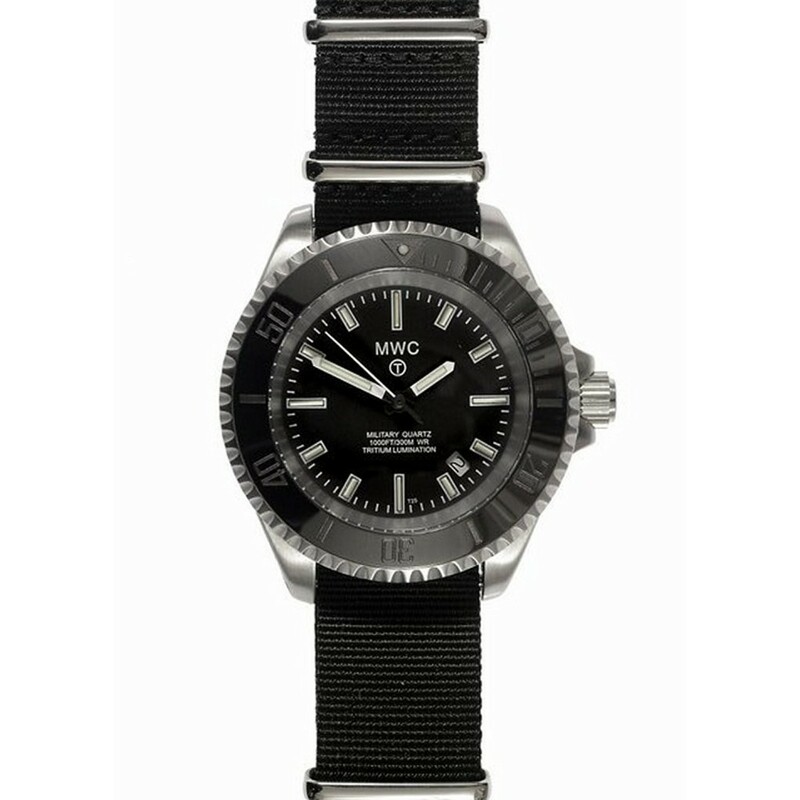 This is an interesting budget brand that’s next on our list of popular Tritium watches. You can probably tell quite quickly that this is a Chinese made watch due to the dual calendar seen in the image, it displays date and Chinese week. 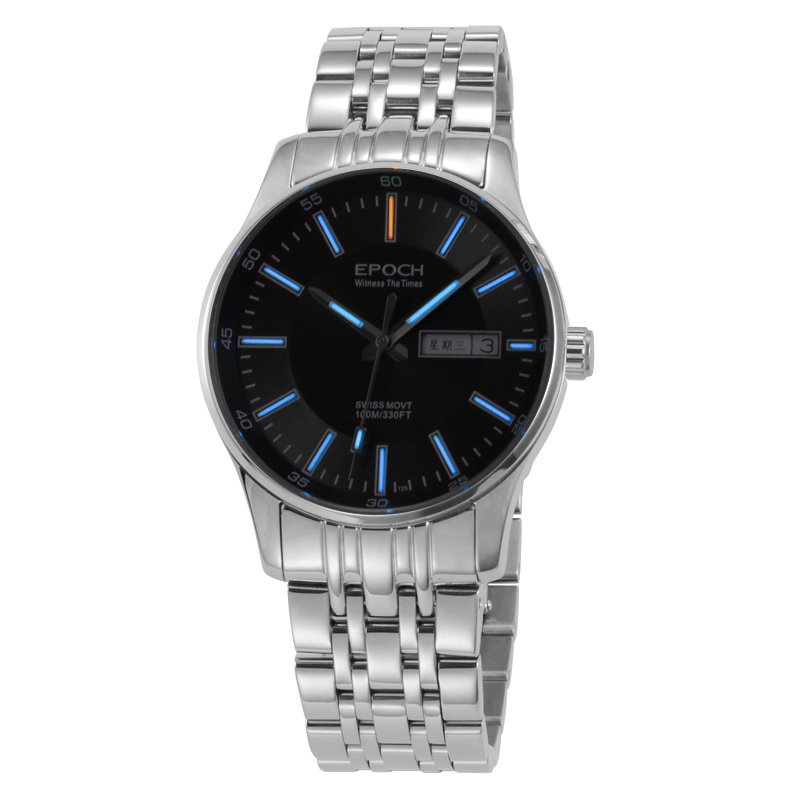 This men’s luminous watch is made from a 38mm stainless steel casing and has a thickness of 10mm. The strap is also made of stainless steel and fastens with a fold over style clasp. In the image above you can see how the watch looks in darkness with the tritium gas tubes illuminating the dial. These make up the slim baton style hour markers around the outer part of the watch. At the heart of this watch is a quartz movement that will give you accurate and reliable timekeeping. An anti-reflective sapphire crystal glass protects the dial which is interesting to see on a watch in this price range. This men’s tritium watch also has a 100m water resistance rating. You can read my full Epoch GTLS watches review here soon. Armourlite are another popular brand for Tritium watches. 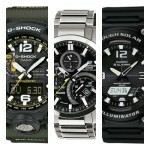 They produce these rugged looking oversized watches that feature the popular GTLS luminous technology. This Tritium watch is build with a large 47mm polycarbonate casing and has a thickness of 10mm. The strap is made of a Nitrile Butadiene rubber and fastens with a buckle style clasp. The dial has a nice easy to read design with clear high contrasting white numeral style hour markers that stand out against the black background. There’s also a handy date display at the 3 o’clock position on this GTLS watch. The Tritium gas light tubes are located on each of the hour markers as well as the hands of the watch to make it very easy to read in dim lit conditions. At the heart of this Armourlite watch is a Swiss Ronda quartz movement for reliable and accurate timekeeping. An anti-reflective sapphire crystal gives you an excellent level of scratch resistant too. The water resistance rating is 200m which is also great to see. All in all a very impressive GTLS watch. You can read my full Armourlite Tritium watches review here soon. 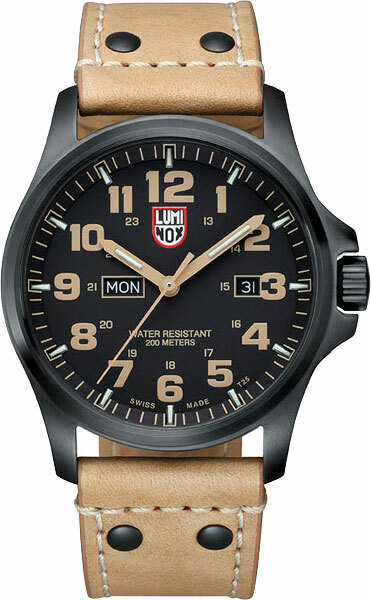 In at number 5 we have another popular military style Tritium watch from Luminox. The Luminox Atacama Field Day Date is built with a black ion plated stainless steel casing that has a 45mm diameter and a thickness of 12mm. This has been paired nicely with a natural brown genuine leather strap with contrast stitching and rivets. It fastens with a buckle style clasp. The dial features these large numeral style hour markers than can clearly be seen against the black background. There’s a nice day and date display on the dial too with a date at the 3 o’clock position and day of the week located at the 9 o’clock position. You’ll find the Tritium luminous gas tubes at each hour markers as well as the hands of the watch. These make this one of the best luminous watches. You can read my full Luminous XL.1925 Tritium watch review here soon. 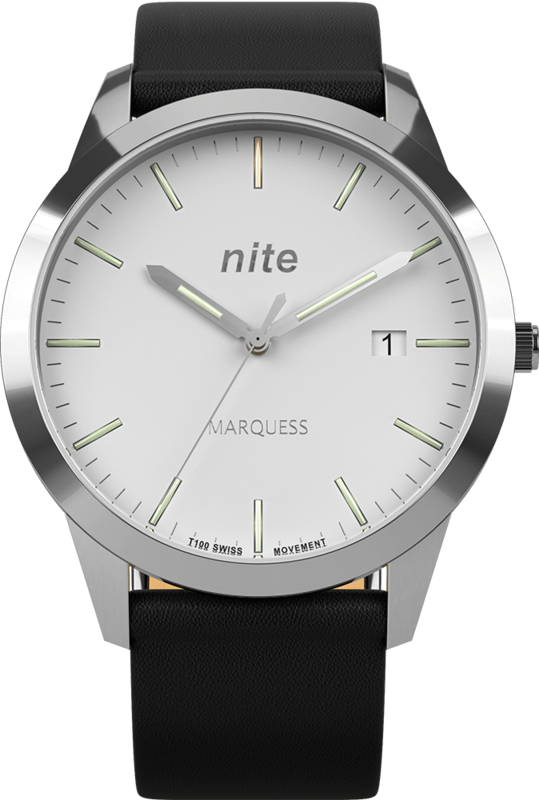 Nite are an independant British watch brand that produces a range of fantastic GTLS watches. The Nite Icon Automatic is one of their higher end models that runs on a Swiss automatic movement. The casing is made of a 44mm black ion plated stainless steel and has a thickness of 14mm. This goes well with a black ion plated stainless steel strap that fastens with a push release fold over clasp. I love the high contrasting dial design of this GTLS luminous watch. The white numeral style hour markers stand out brilliantly against the black background. There’s also a date display tucked between the 4 and 5 o’clock hour markers. T25 Swiss made GTLS illumination lights of the dial of the watch for excellent visibility in dim lit conditions. At the heart of this Tritium watch is a Swiss made Sellita automatic movement that’s very popular in the watch community. This self winding Swiss movement is powered by the movement of your wrist and never requires a battery. As I’m sure you were expecting from this high quality GTLS watch, it also features a sapphire crystal glass with an anti-reflective coating. A 100m watewr resistance rating is a great added bonus in my eyes too. You can read my full Nite Icon GTLS watches review here soon. 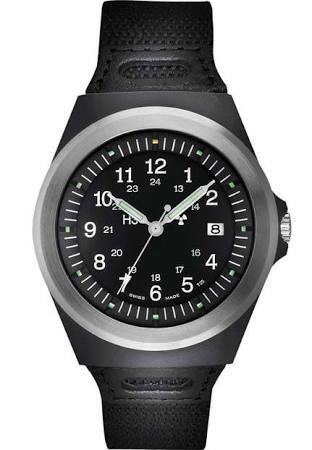 This next GTLS watch comes from MWC (Military Watch Company) who, you guesssed it, produce military style timepieces. I just want to point out the ceramic bezel design on this watch straight away, it looks fantastic. This MWC tritium watch is made with a stainless steel 43mm casing that has a thickness of 15mm. It’s been paired up with a military style Nato fabric strap in black. It also has a screw down crown which a lot of people may be after. The dial is actually a little small when you take into account the size of this huge ceramic bezel. It has a simple dial design with baton style hour markers that are actually made from the GTLS tritium light sources. These GTLS also feature on the hands for better visibility in dim lit conditions. A small date display is found tucked between the 4 and 5 o’clock positions on the watch. At the heart of this illuminated watch is a Swiss made Ronda 715 movement that gives you reliable and accurate timekeeping. A mineral crystal glass protects the dial from scratches and shattering. Mineral glass is actually a lot more shatter resistant than sapphire in this case. An impressive 300m water resistance rating is brilliant to see on this Submariner style Tritium watch. You can read my full MWC glow in the dark watch review here soon. Up next in today’s list of the best GTLS watches is this men’s Detomaso Japanese automatic timepiece. This durable tritium watch is built with a black stainless steel 45mm casing and has a thickness of 14mm. The strap matches this and fastens with a fold over clasp and includes a saftey catch. It also has a screw down knurled crown. The dial features these large bold numeral style hour markers in orange that stand out well. The hour markings and hands are illuminated by Tritium T25 GTLS (Gaseous Tritium Ligh Sources). These give fantastic illumination and don’t require any outside energy source. There’s also a useful date display at the 3 o’clock position. At the heart of this tritium watch is a Japanese automatic Miyota movement which never requires a battery as it’s powered by the movement of your wrist. A sapphire crystal glass gives you an excellent level of scratch resistance which is great to see. 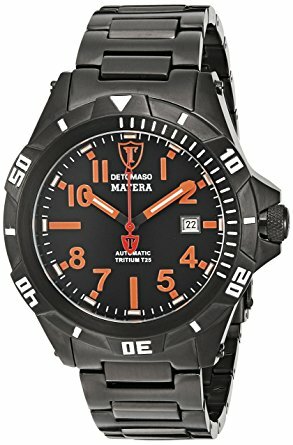 This men’s tritium watch also has a 200m water reisstance rating. You can read my full Detomaso Matera GTLS watches review here soon. Here we have another popular GTLS watch from Nite. This is more of an affordable minimal timepiece from them. It’s built with a 40mm stainless steel casing and has a thickness of 8mm making it quite a slim watch. 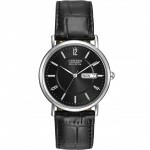 The strap is made of a black genuine leather and fastens with a stainless steel buckle. The dial has a simple design to it with a white background and GTLS tubes are used to mark out the hours. A small date display is located in the 3 o’clock position. The GTLS luminous gas tubes are located on each hour as well as the hands of the watch for excellent visibility in dim lit conditions. This men’s GTLS watch is powered by a Swiss Ronda quartz movement for reliable and accurate timekeeping. A anti-reflective coated sapphire crystal glass gives you a high level of scratch resistance. It also has a 50m water resistance rating which may come in handy. 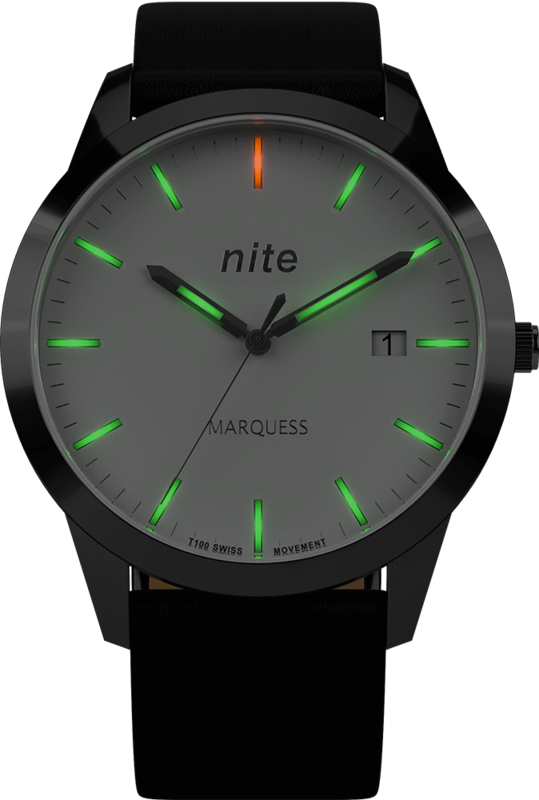 You can read my full Nite Marquess illuminated watches review here soon. Last up on our list of the best Tritium watches for men is this hugely popular Luminox timepiece. Luminox are known for working closely with military grounds and special forces like the Navy SEALs to produce custom watches for all their needs. This men’s Navy Seal colormark is built with a ultra-light polycarbon casing that has a 44mm diameter and a thicknss of 13mm. The black PU rubber strap has a width of 23mm and fastens with a buckle style clasp. This tritium watch features a high visibility contrasting dial design with bold white numeral style markers and thick white hands that stand out against the black background. The large unidrectional rotating diver bezel adds an extra touch of wow to the oversized watch. You’ll also spot a small date display at the 3 o’clock position. GTLS tubes provide constant night visibility for up to 25 years without the pushing of a button or any recharging. These GTLS tubes are placed at each hour markers and on the watch hands. A Swiss quartz movement powers this watch giving you excellent timekeeping and reliability. The Luminox tritium watch also has a mineral crystal glass for scratch and shatter resistance, for this style of watch mineral crystal is preferred over a sapphire glass. Last but not least is the 200m water resistance rating which many people are likely to be very pleased with. You can read my full Luminox Navy Seal Colormark Tritium watches review here soon. Thanks for taking the time to read through today’s list of the best Tritium watches for men. What was your favourite model? Comment below and let me know.